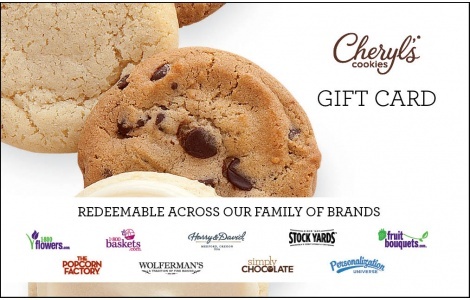 For more than 30 years, Cheryl’s has been making our award-winning baked goods with the same level of care you use when baking for family and friends. We select the finest sweet cream butter, the most decadent chocolate, the choicest dried fruits and nuts, the purest vanilla, and the highest quality sugar and honey available, in order to make everything from our brownies to our buttercream the most delicious gift you can send. This gift card can also be redeemed at any of 1800Flowers.com nine brands. From our kitchen to yours, enjoy! National Gift Card is the best place for you to order gift cards in bulk. We are the experts in all things gift cards and can set up your gift card solutions program for you today. Please contact us for more information on bulk, direct-to-recipient, or individual gift card fulfillment for your gift card program. Contact us here or call us at 888-472-8747 today! The following Terms and Conditions govern your use of, and our obligations with regard to, our Gift Cards and Promotional Offers. By purchasing or redeeming any of our Gift Cards and Promotional Offers, you are acknowledging and agreeing to these Terms and Conditions. The terms "you" and "your" refer to the person who purchased and/or the person who is redeeming our Gift Cards and Promotional Offers. The terms "we," "our" and "us" refer to 1-800-Flowers.com, Inc. and its related Affiliates, including Fresh Gift Cards, Inc. Call our toll-free number 1-800-242-5353 to check your Gift Cards and Promotional Offers balance. •	Online at: www.1800baskets.com, www.1800flowers.com, www.cheryls.com, www.fruitbouquets.com, www.thepopcornfactory.com, www.harryanddavid.com, www.wolfermans.com, www.stockyards.com., www.personalizationuniverse.com, and www.simplychocolate.com. •	By phone on orders for 1-800-BASKETS.COM, 1-800-FLOWERS.com®, FruitBouquets, Cheryl's®, and The Popcorn Factory. •	Limit one Gift Card per order. •	May become redeemable at additional brands and locations, which information will be updated on this page. •	See conditions and restrictions as detailed below.